40 Chic and Modern Hard Part Haircut Ideas – Cuts with a Trendy Touch! The hard part haircut might not seem like a hairstyle on its own, but it makes a perfect addition to any design. 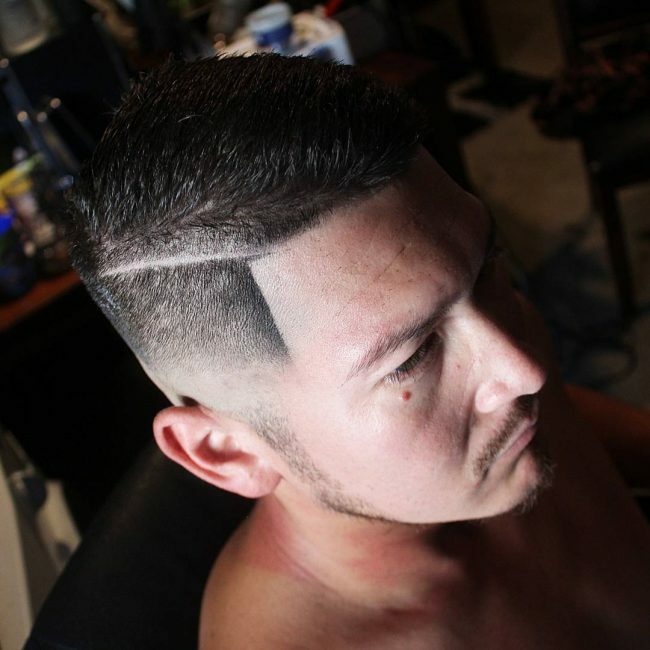 It is also known as the side part or razor line, and it entails forming one or a couple of sharp lines on the sides. You can create the line with a trimmer or shaving razor, but it requires some skills and precision to get it right. This line also requires some maintenance so as to ensure that it is still visible as your hair grows. Below are some styles that will show you how to make the razor line part of your hairdos. 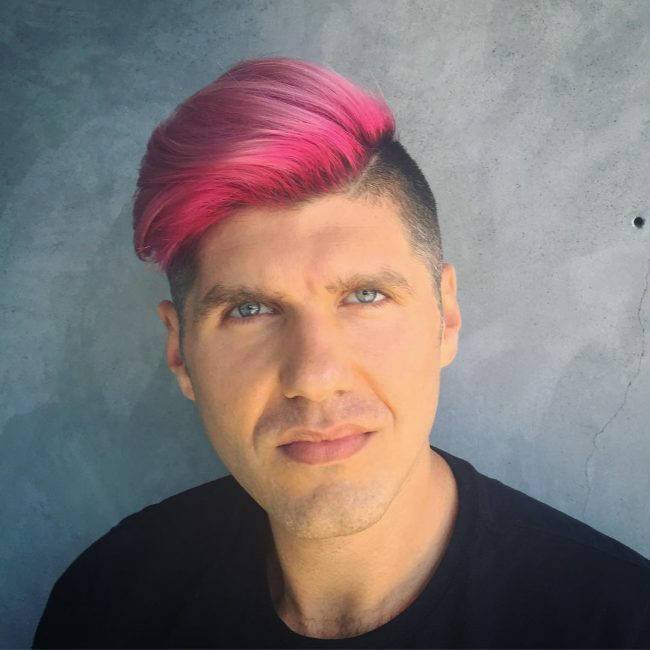 You will require a pink dye to create this look, but you should only use it after getting the cut. The haircut is about chopping the sides short, leaving some long bangs at the top and creating a small line between the two sections. You should then give the long locks a pink shade and finish by styling them with a sweep to the side. The comb-over hairdo works well for men that know how to cut and style it. 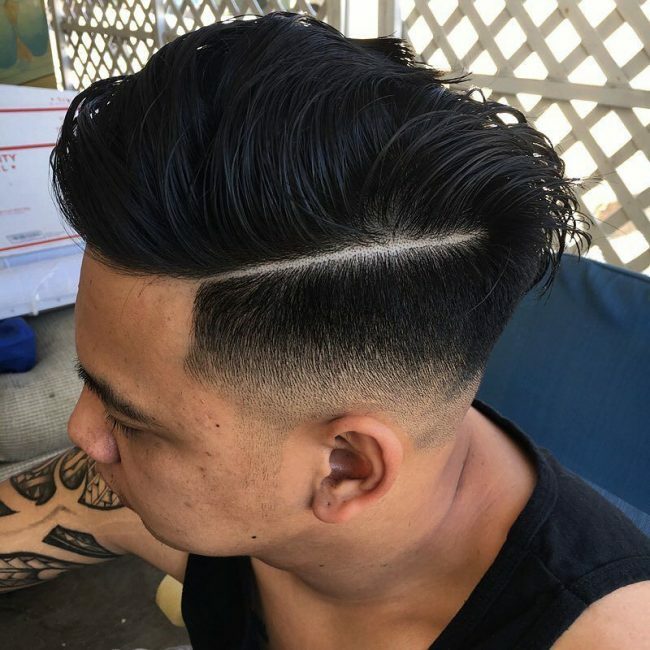 This particular one has the comb-over design at the top and a side part to create a disconnection with the skin taper fade on the sides. 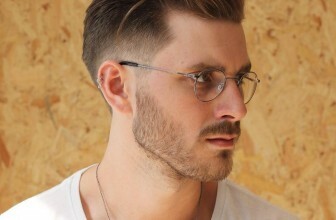 Although there is still more to this cut, the sharp line-up and skin fade are the highlight of the look. The design also has a hard part line and some short spiky locks at the top that you should style with a slight side sweep. 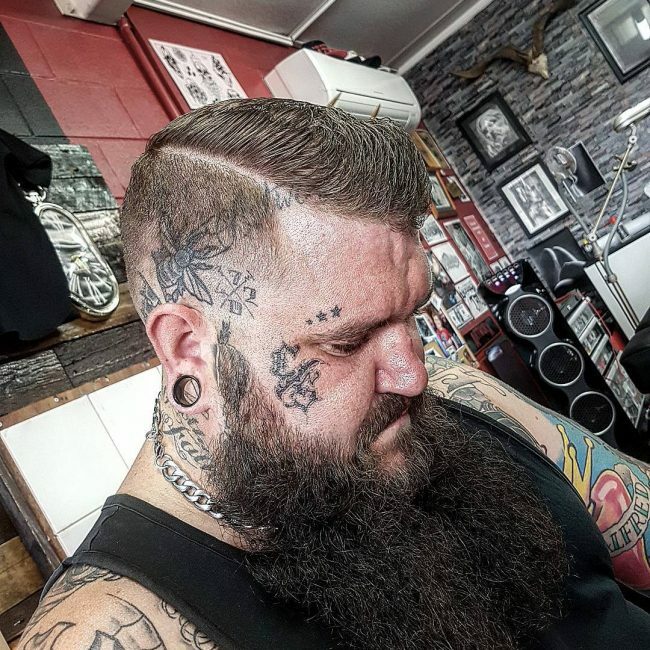 This majestic cut is an example of what you can get from a skilled and experienced barber. 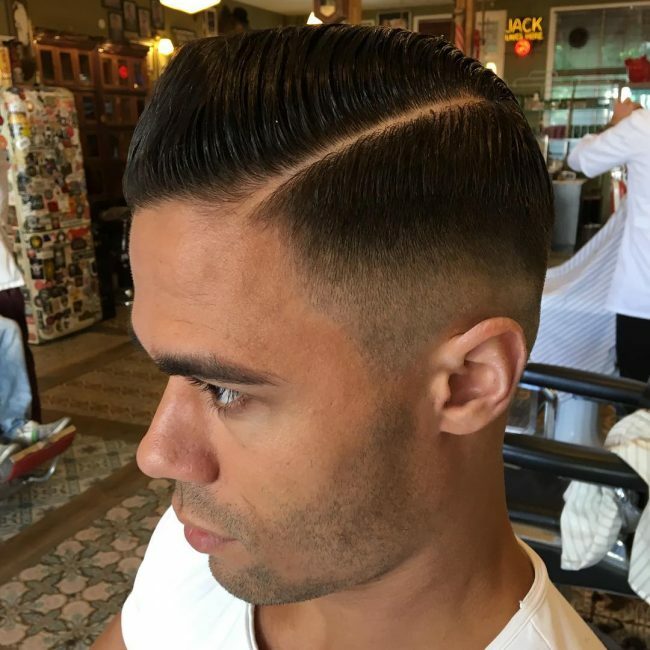 It has a zero fade of the sides and back, but the two clean double lines are what make the hairdo stand out. This funky hairstyle is for men with a long thick mane. 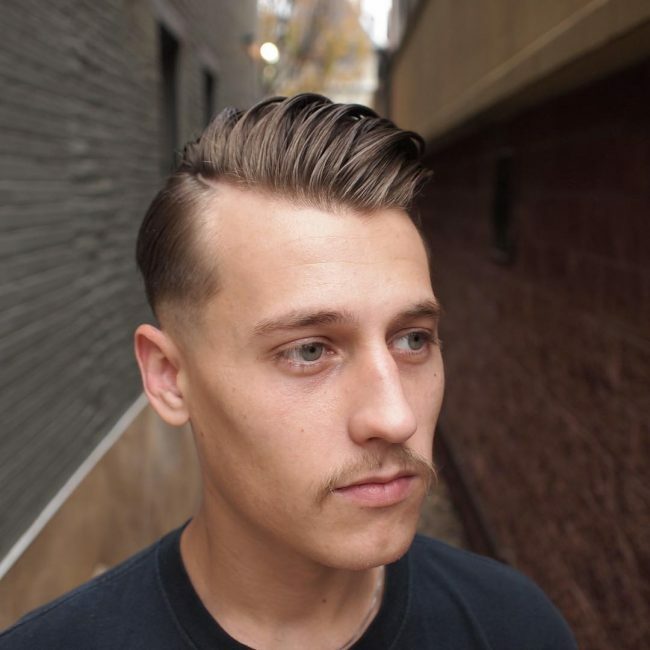 It entails leaving a thick and upswept hair in the middle and chopping the sides short. You should then fade the sides and spice up the look with a razor line. 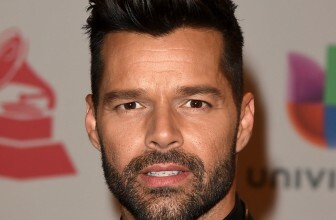 A small quiff at the front and a comb over behind it are the highlights of this look. 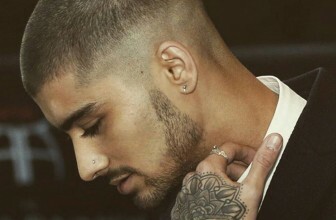 Apart from the quiff the style also has a hard side part and a tapered drop fading on the sides. 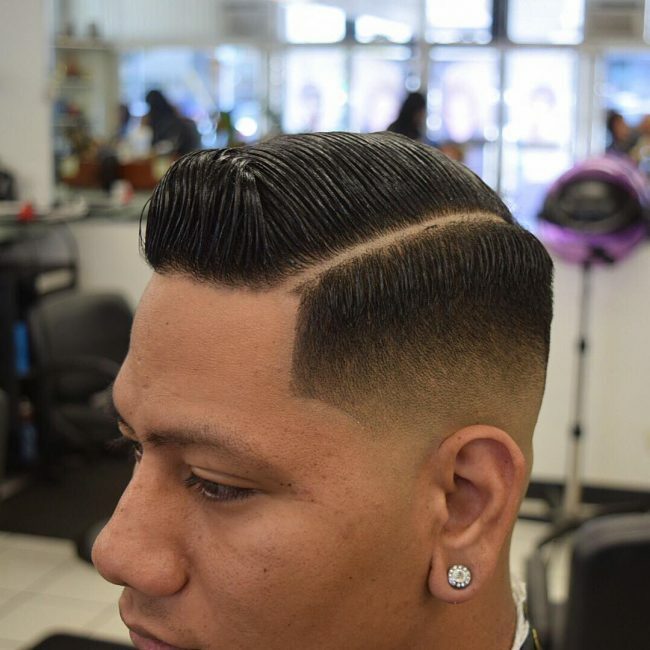 You will need to leave a thick hair on the crown and use a generous amount of gel to create this classic pompadour. 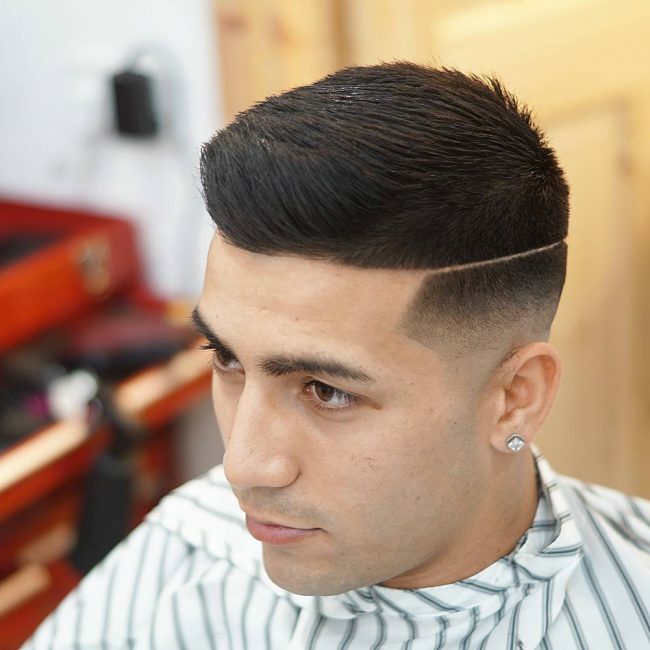 The style will also require you to shave a sharp razor line on the sides and a zero fade. It is hard to find any comb over style that can beat the elegance of this one. Apart from the sleek comb over, the style also has a hard part and a smooth fade. This cute hard part haircut requires you to leave some textured wavy locks on the crown that you should style with an upsweep. 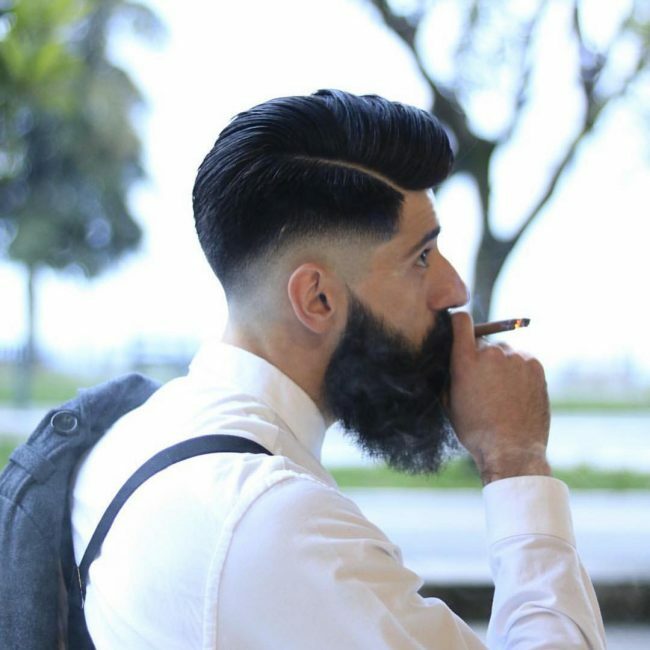 You should then shave the sides short and fade them before finishing with a razor line. 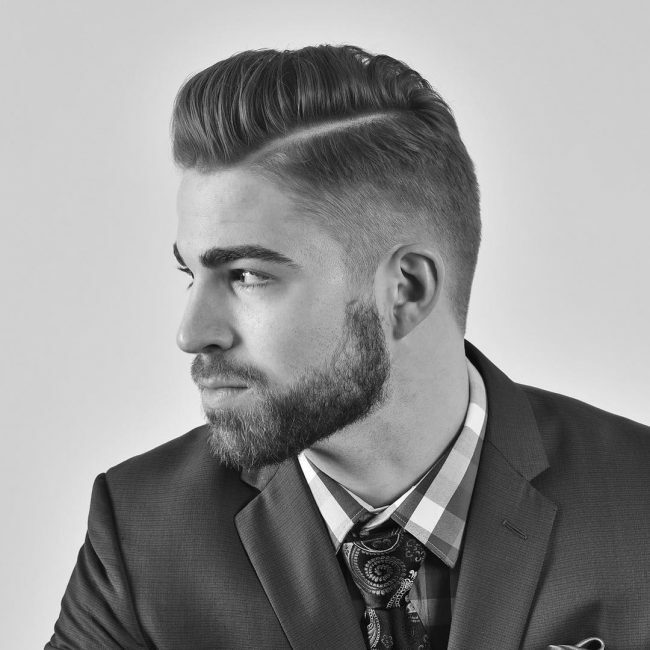 There is no better idea for giving your classic pompadour a modern touch than with a sharp part line on the sides. 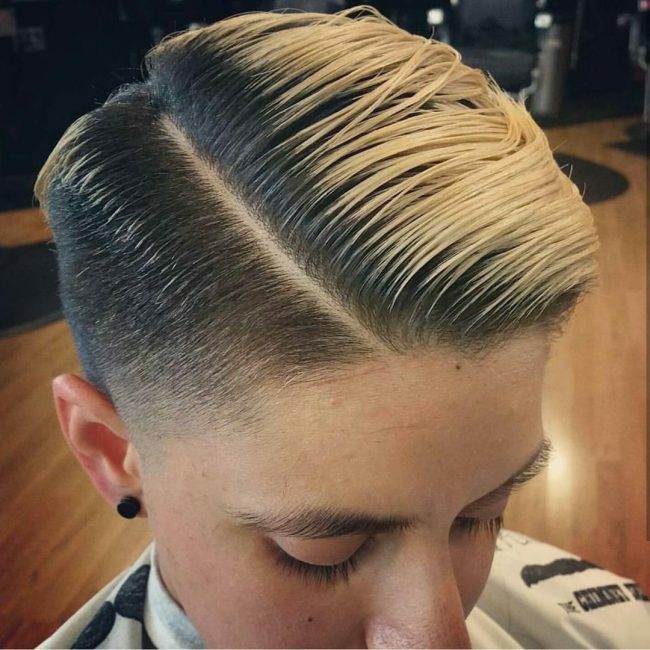 And if your strands have an excellent texture like these, a uniform fade on the sides is the only other thing that you need for an attention-grabbing appearance. 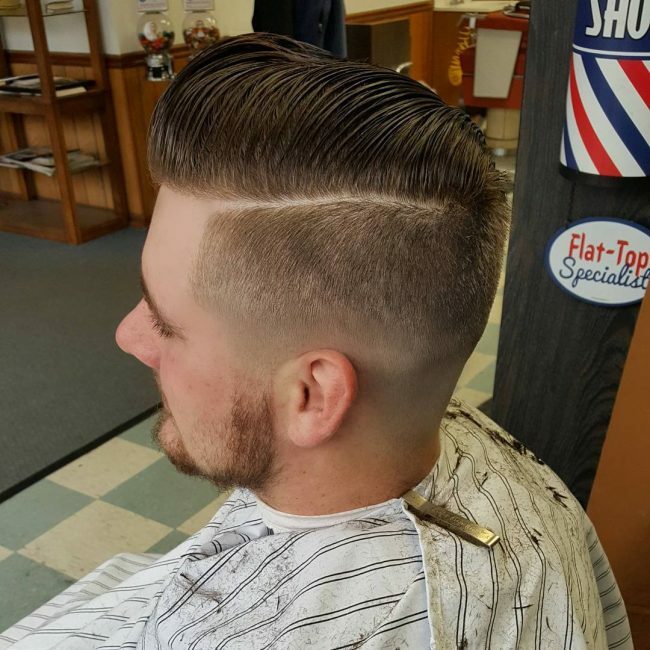 Every gentleman that wants to look classy should wear a cut like this one. 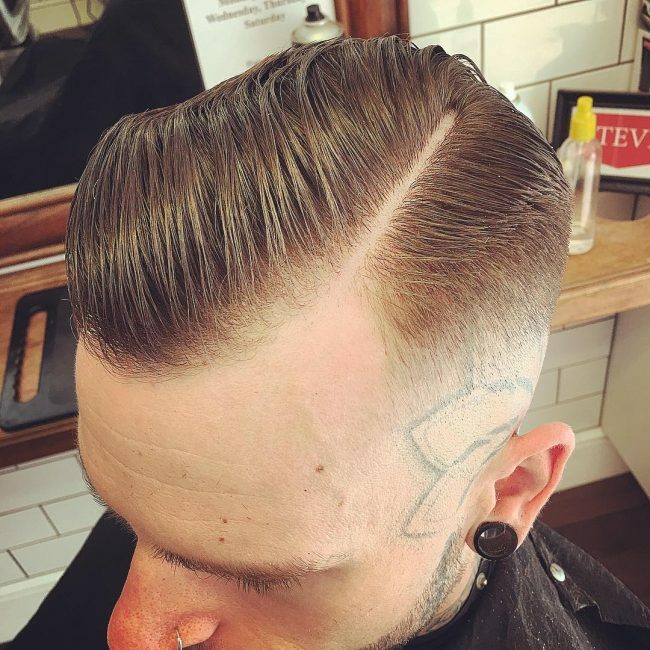 You should taper fade your strands at the back and sides while leaving a thick mane at the crown that you should then style with a pompadour-like comb over and a side part. 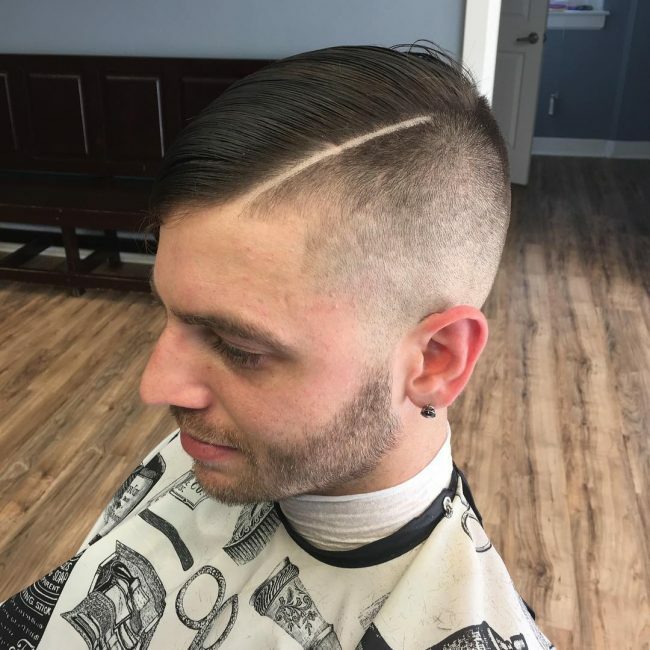 This hard part haircut is about spicing up the traditional Caesar style with a razor line and by sharp fading the sides and back. This look requires leaving a few inches at the top and styling them with a pomade or any other good hold product after blow drying them. 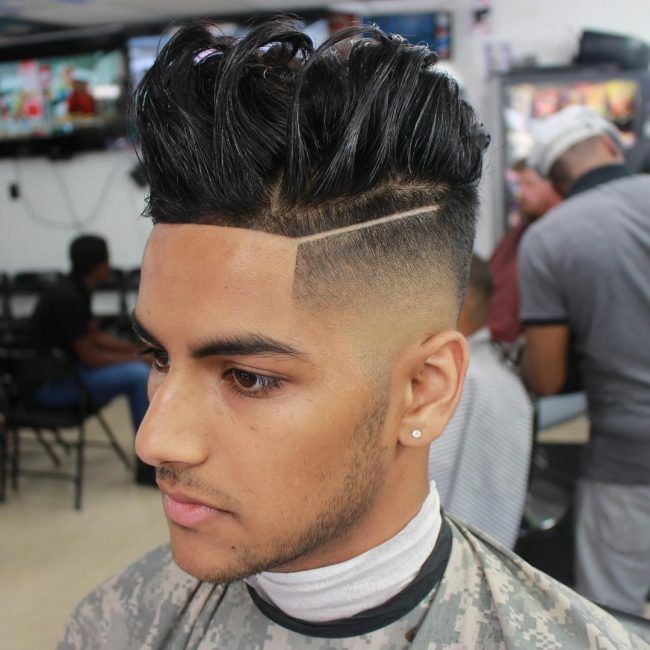 You should then give the hair a sharp part and finish with a skin taper fade. 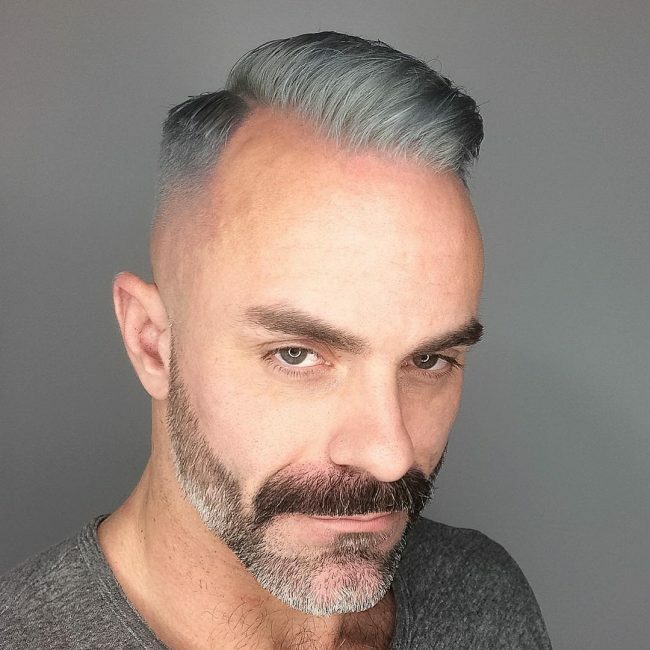 The shine on this hard part haircut is fantastic, and it makes the strands look neat and healthy. 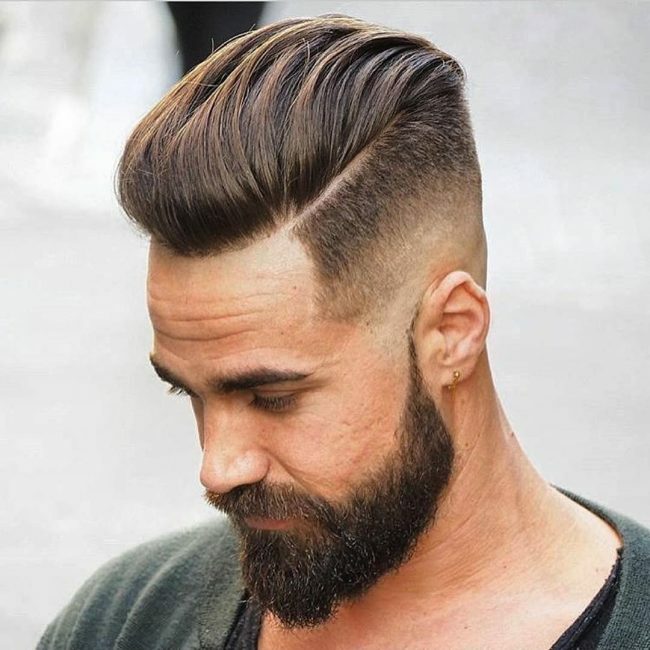 To create this look, you should style the long hair at the top with a lift at the front and a comb over before completing the design with a side part. The color and cut on this headdress are just perfect, and they give the wearer a clean and elegant appearance. Everything from the slight comb-over to the hard part line and the skin fade on the sides is flawless. Messy top hairdos always look marvelous and to create one like this you only need to leave some long strands on the upper part and run your fingers through for the messy look. 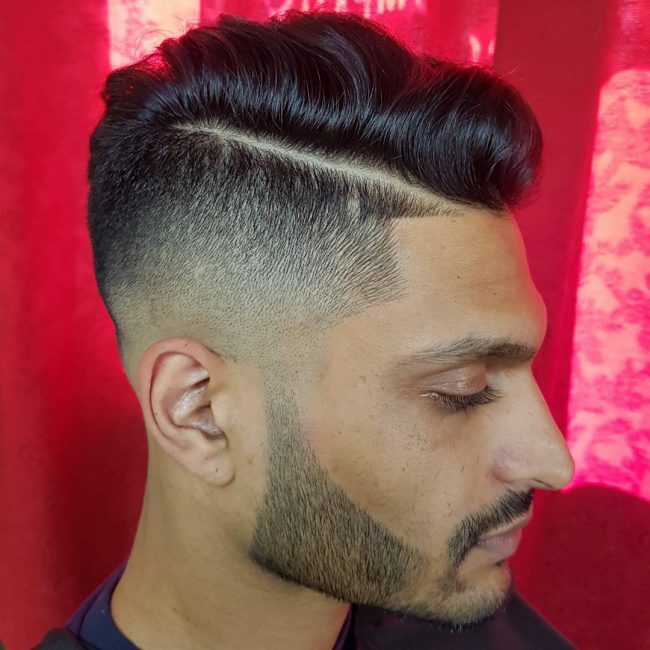 You should then end the style with a mid fade on the sides and by shaving two razor lines with one flowing in a wavy design. The comb over is easy to create and also very fashionable. 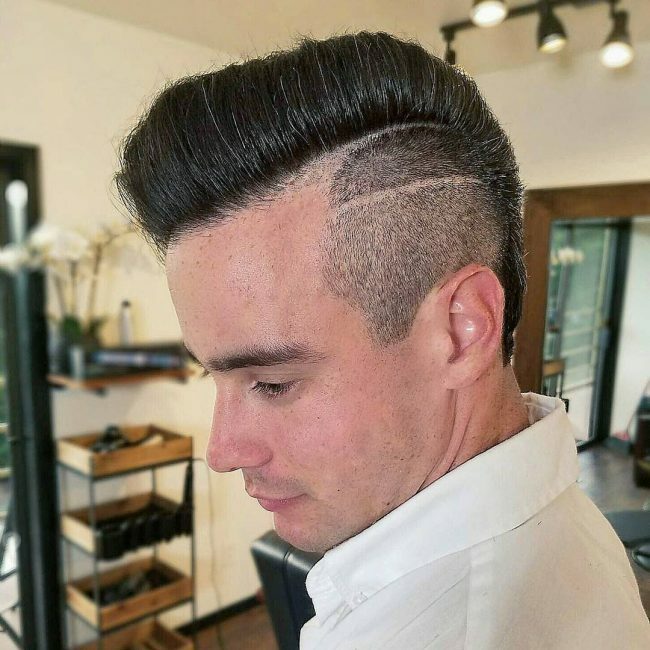 This one takes things a notch higher with a side part and a high skin fade. 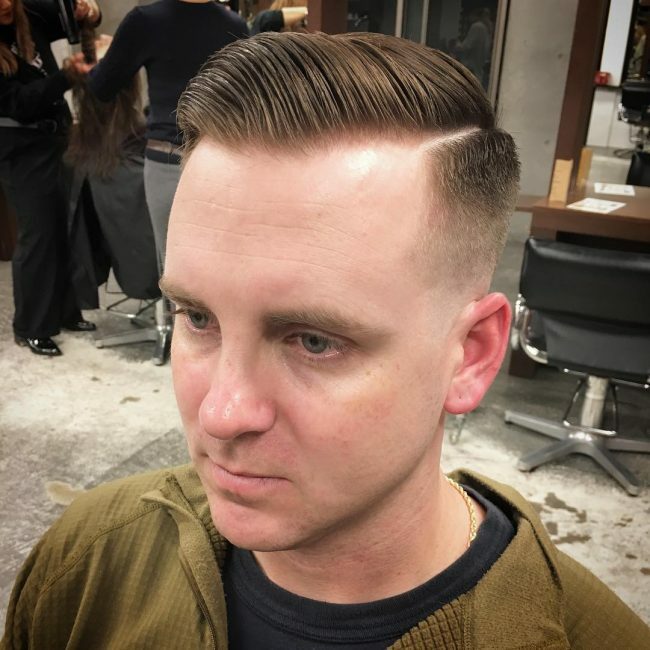 Here is another sleek comb over design that you can achieve with a nice hard part haircut and by using a generous amount of gel. 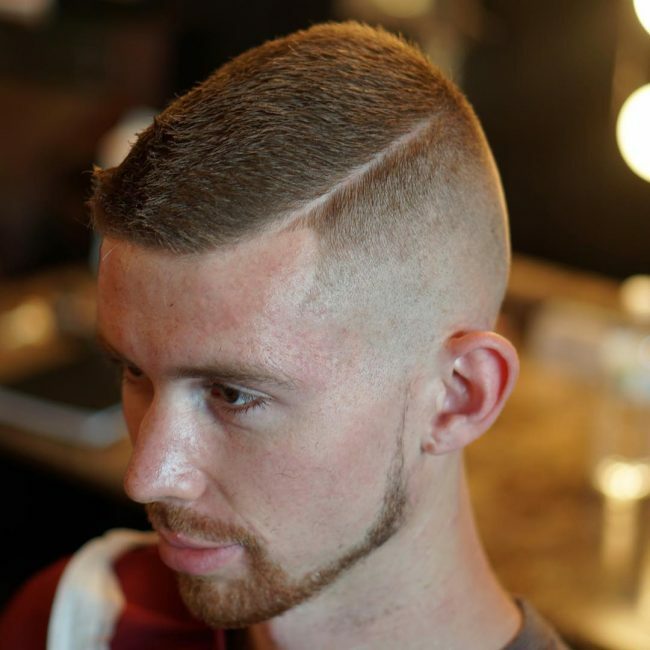 The style also finishes with a zero skin fade at the back and on the sides. 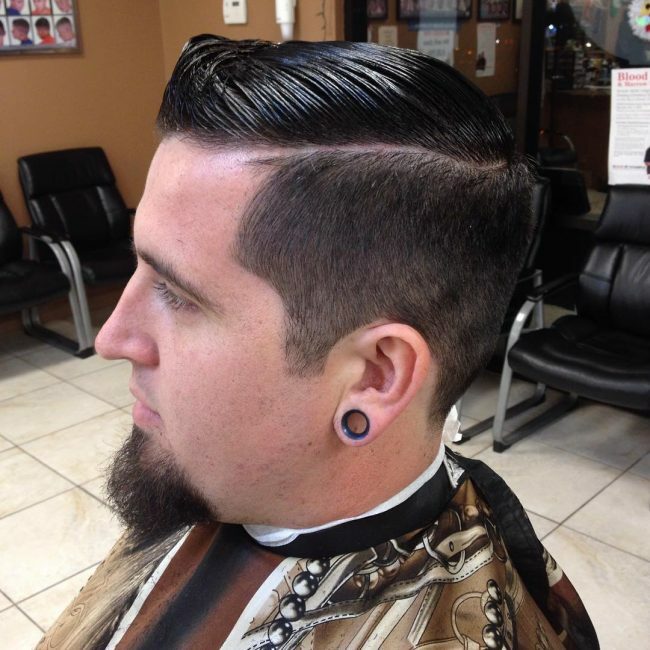 The neat spikes at the top of this haircut are hard to resist as they will make any man look classy and fashionable. 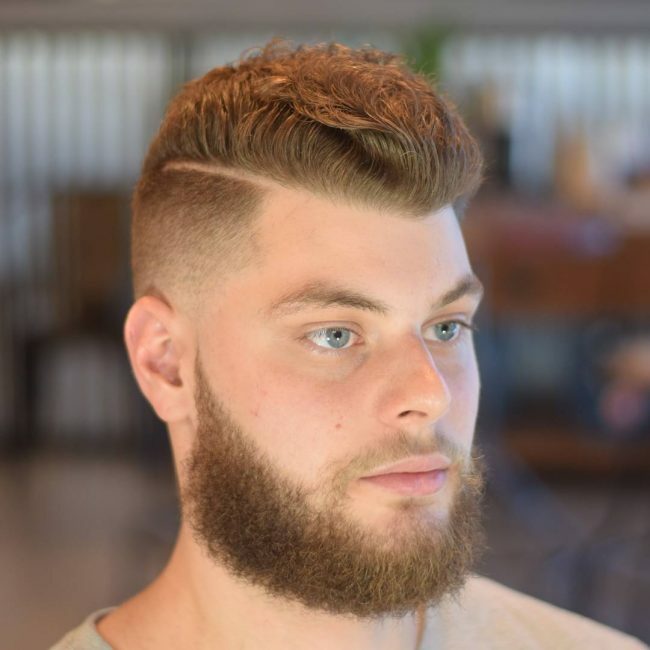 They are a result of a skillful scissor trim, and you should style them with a front and side sweep and enhance the appearance with a sharp and crispy line before ending the look with a zero fade. This style proves that it is possible to maintain some curly locks throughout the head and still look trendy. 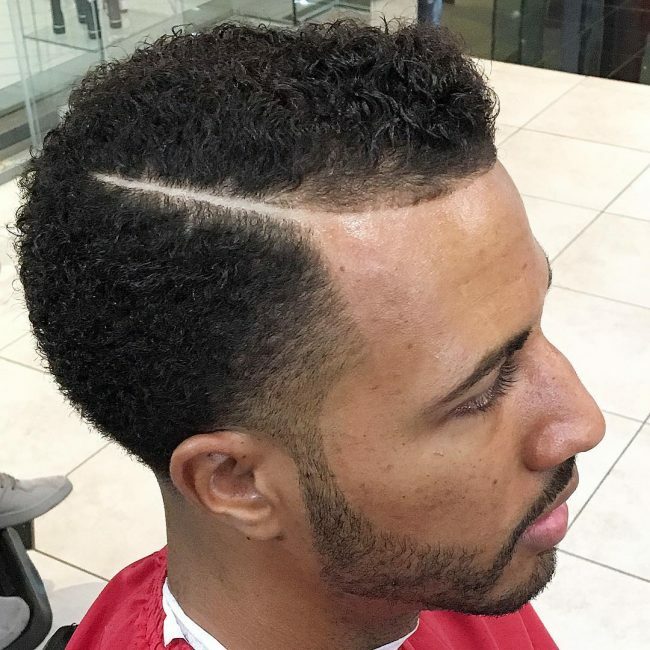 To do this, you should give your curls a shadow taper by shaving a small section on the sides and create a hard part line. 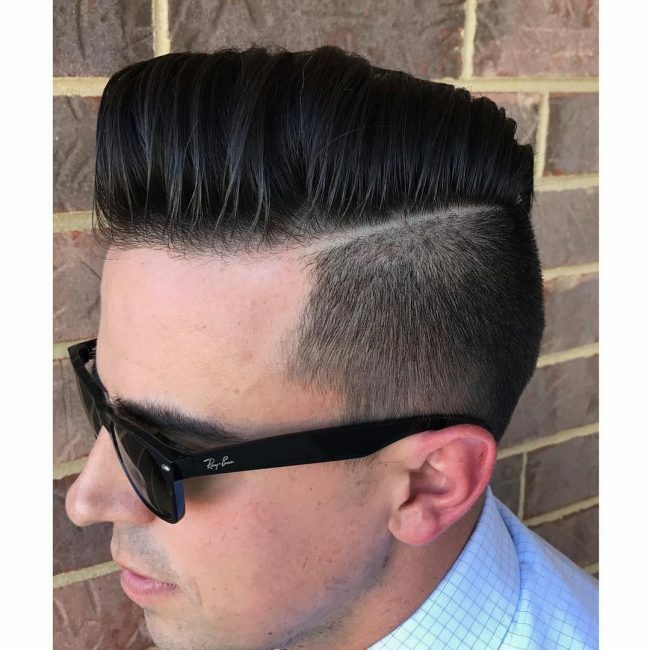 The textured locks at the top of this cut have a beautiful comb over styling that gives them a unique and classic look. 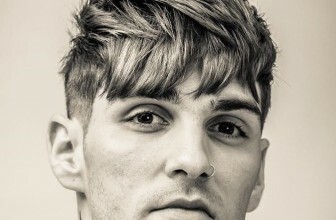 This style also has a razor line on the sides, and some smooth brushed back strands below it. A cute hard part haircut like this one will also require you to use a quality hair product. 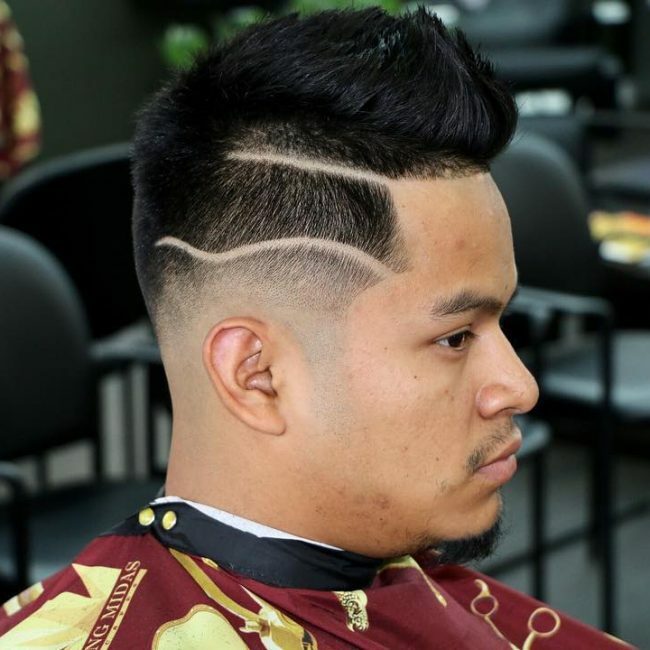 The cut involves taper fading the sides and back while also creating a razor line to disconnect the tapered sides from the smooth side sweep at the top. You can still wear a beautiful hairdo with a hard part even if you have a widow’s peak. 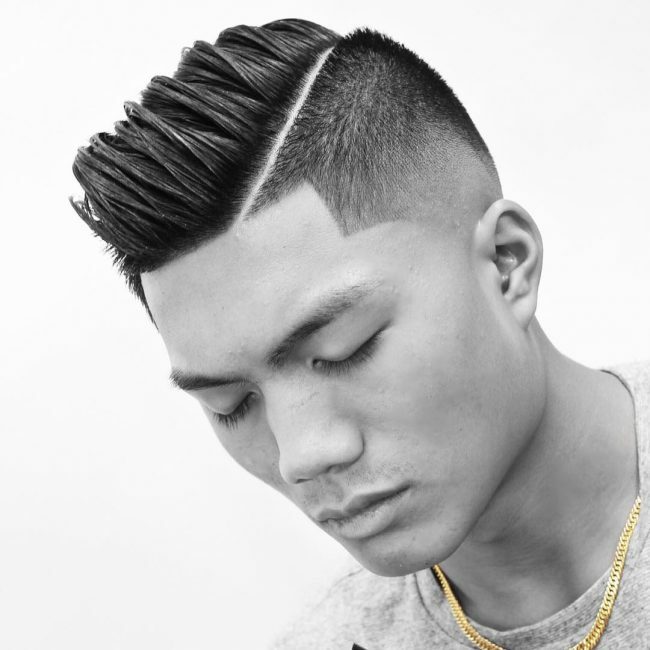 This design entails tapering the sides and forming a razor line before finishing with a side sweep of the strands at the top. A sharp side part line like this one is enough to spice up any hairdo and if you have a textured comb over like this one you can be confident of a head-turning look. 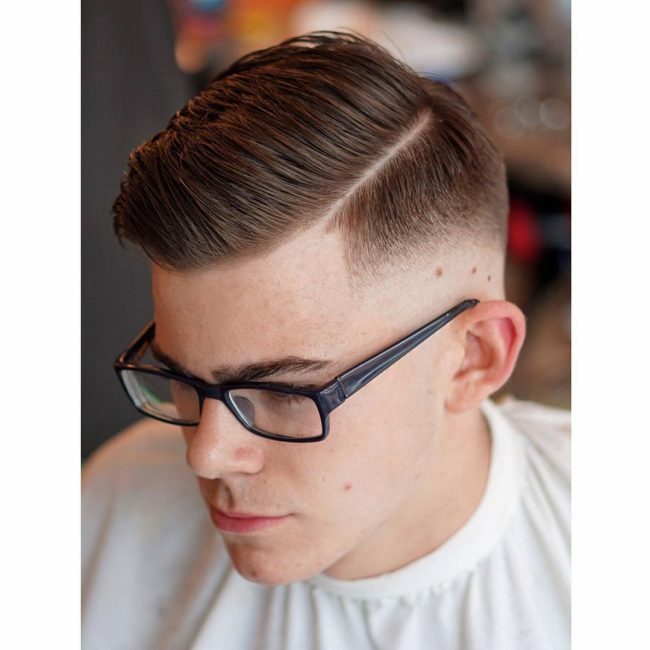 The style also has a skin fade on the sides and a regular line-up that gives the wearer some extra elegance. 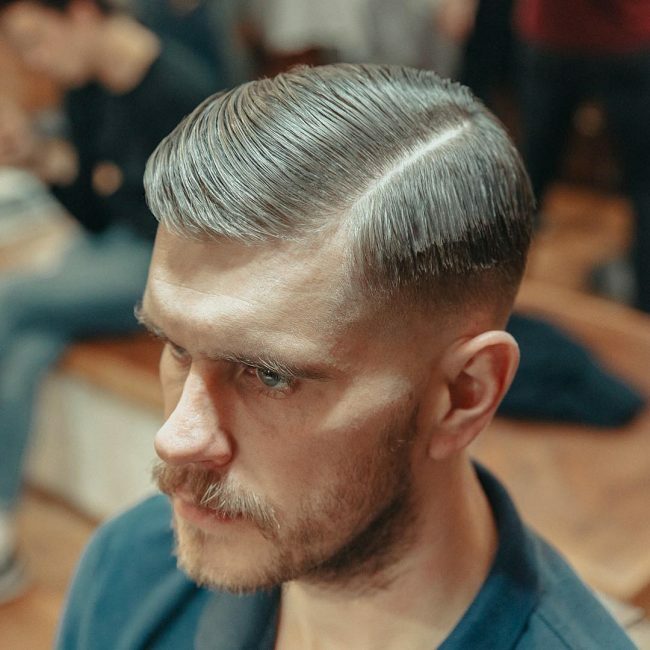 Although the clean and sleek comb over design is already beautiful, enough the hard side part still makes a significant difference for this hairdo. 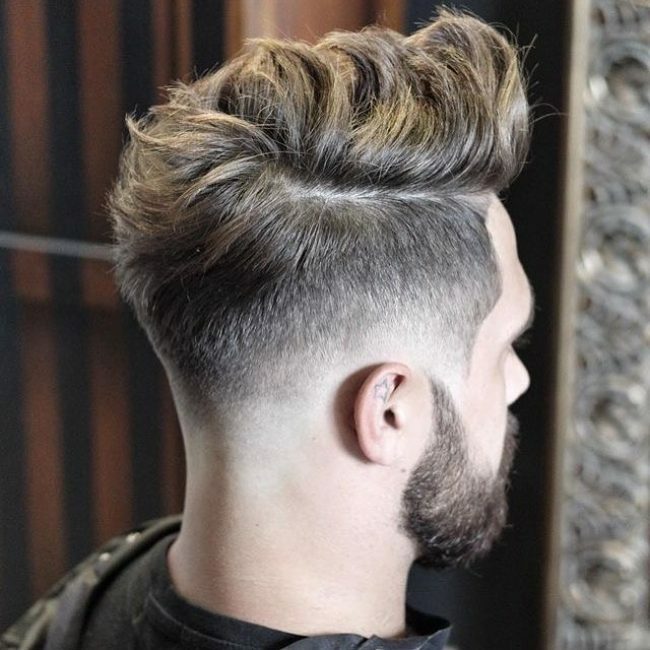 The line creates a trendy disconnection between the top and skin tapered sides and it helps make this cut unique. 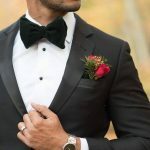 This classic cut will make any man look fashionable, and it does not require a lot of effort to form. A sharp razor line on the sides, a skin fading and some side-swept strands at the top are all that you need for this look. 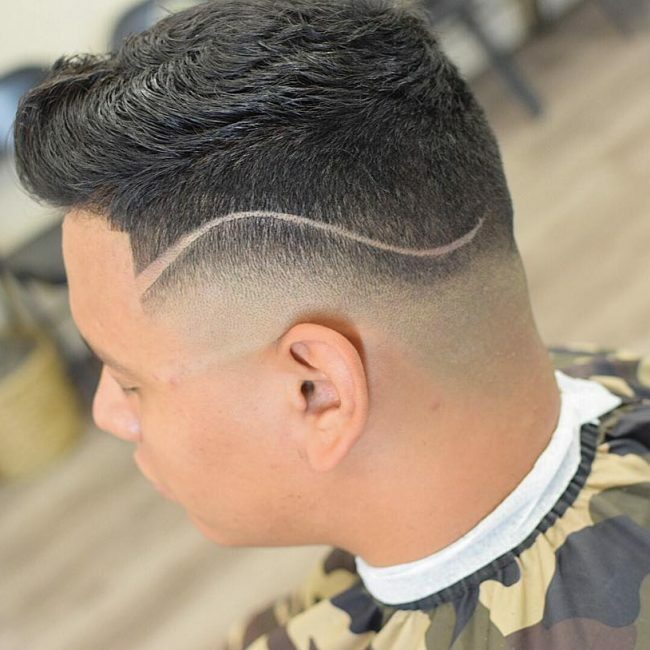 This cute hard part haircut comprises of a classic pompadour on the upper section, a razor line below it and a smooth and neat tapering one the sides. 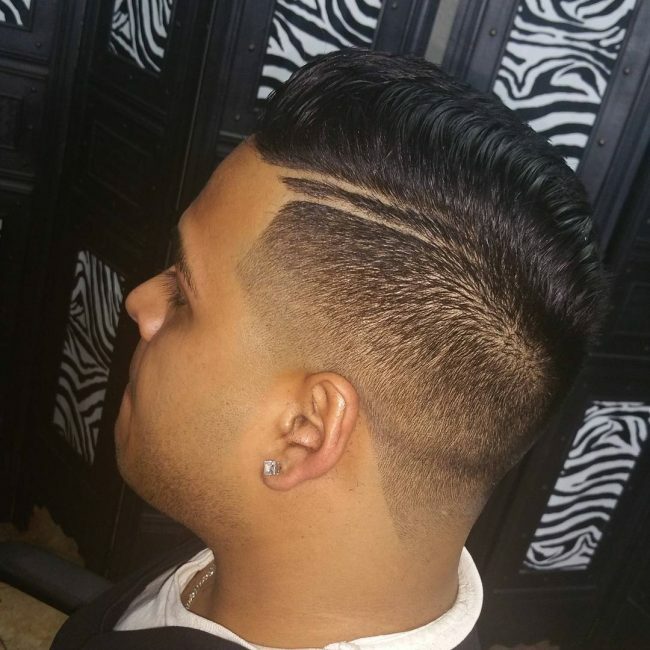 It is a very comfortable look for men with a thick or medium volume hair. Although it might not resemble the classic pompadour, this design still qualifies as one. 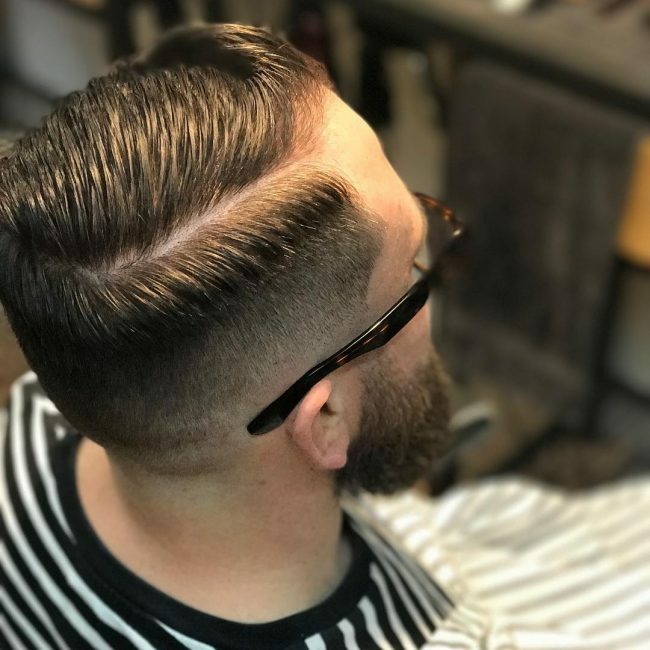 It is lower than the traditional ones, but the razor line on the side that creates a disconnection with the tapered and skin faded sides is what makes this design unique. 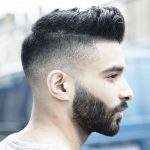 The short spiky and wavy strands at the top of this haircut look amazing, and you only need to give them a subtle front sweep. This headdress also has a straight line on the sides that separates the buzzing and skin fading below it from the design at the top. 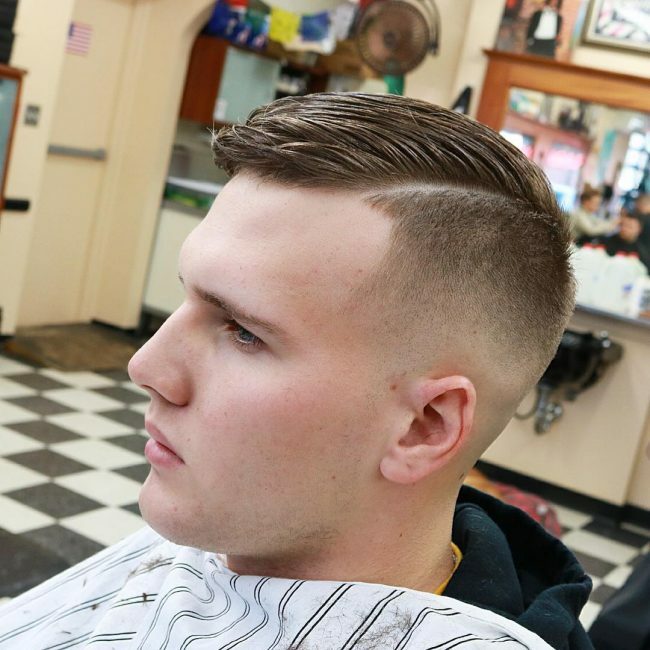 This style maintains some thick and wavy strands at the top and a skin razor fade on the sides. But, the fancy part line on the side is what stands out. 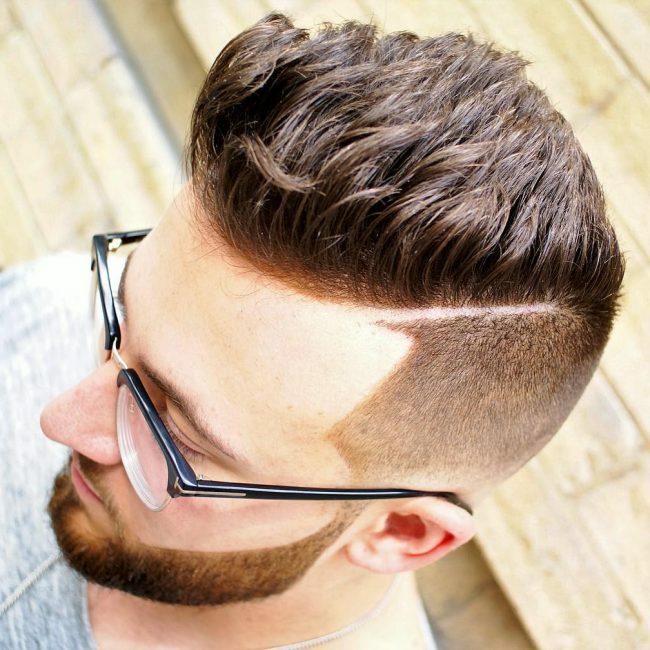 Tapered haircuts seem to work for most men as they allow them to maintain some length throughout the head. 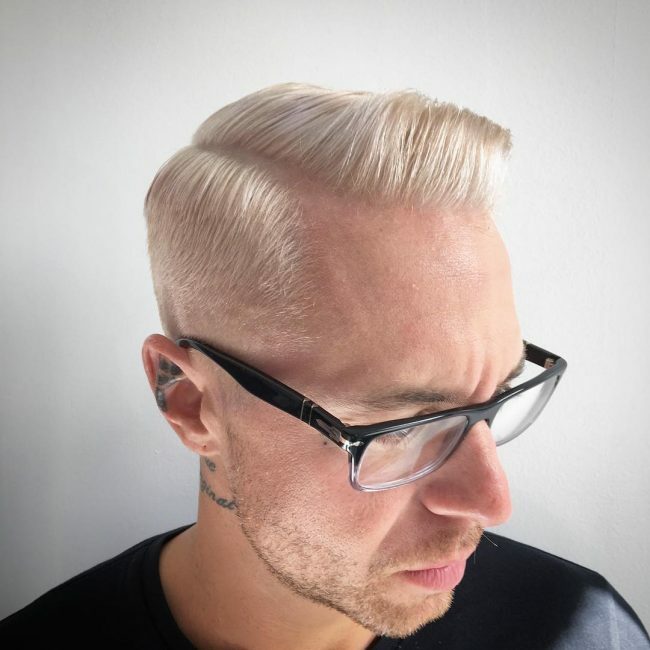 Apart from the tapering, these strands also have a beautiful blonde shade and an attractive styling that entails forming a hard razor line and sweeping the strands at the top to the side smoothly. The cute waves on the crown look fantastic, and if you have wavy natural hair, a good gel is all you need for this style. You also need a hard part and a smooth fade on the sides to complete the look. Hair with a perfect texture like this one will always make an impressive hairdo. 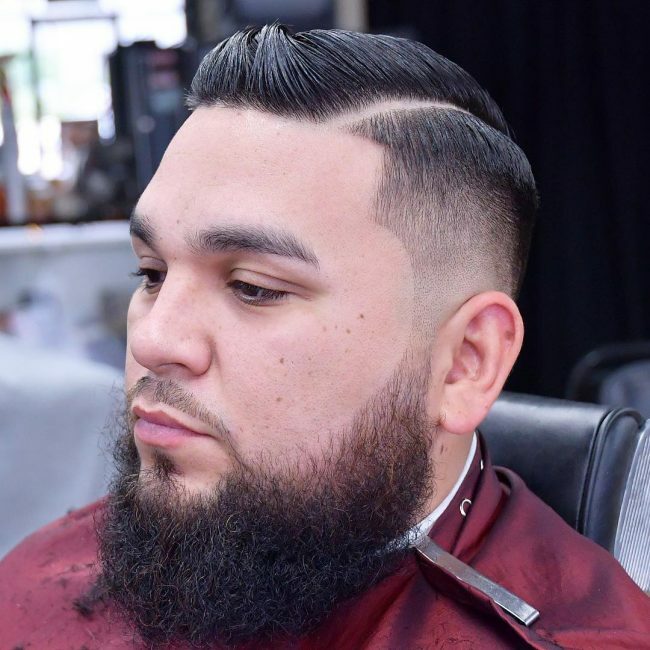 It has a sharp razor cut that also entails forming a side part and skin fading the sides and finishing with a forward sweep of the long locks at the top. If you prefer a hard part haircut that maintains long textured bangs at the top this is the style for you. 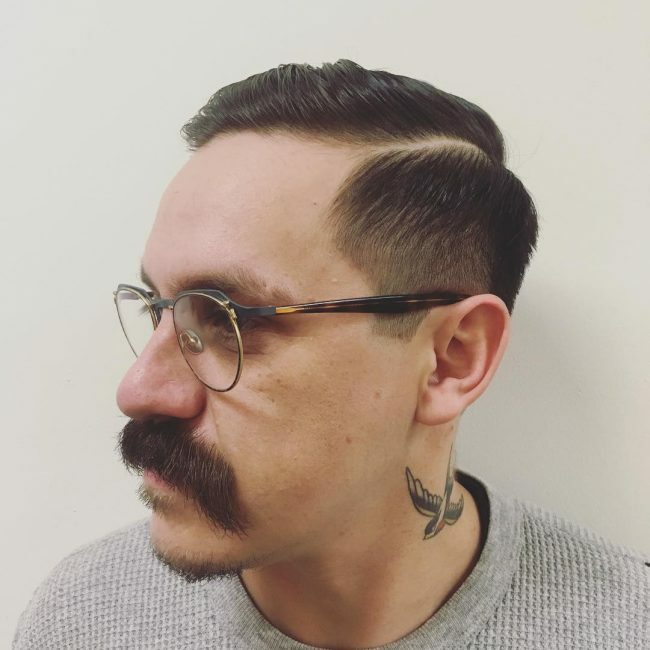 The haircut has some long textured locks on the top portion that you should style with a comb over and a side part that disconnects them from the skin taper fade on the rest of the head. This hairstyle is also about leaving some textured bangs at the top and disconnecting them with a soft razor line. But, the styling of the locks at the top involves brushing them back in subtle layers. Platinum blonde is a bright and attractive shade, and this is enough reason to have it in your hair. 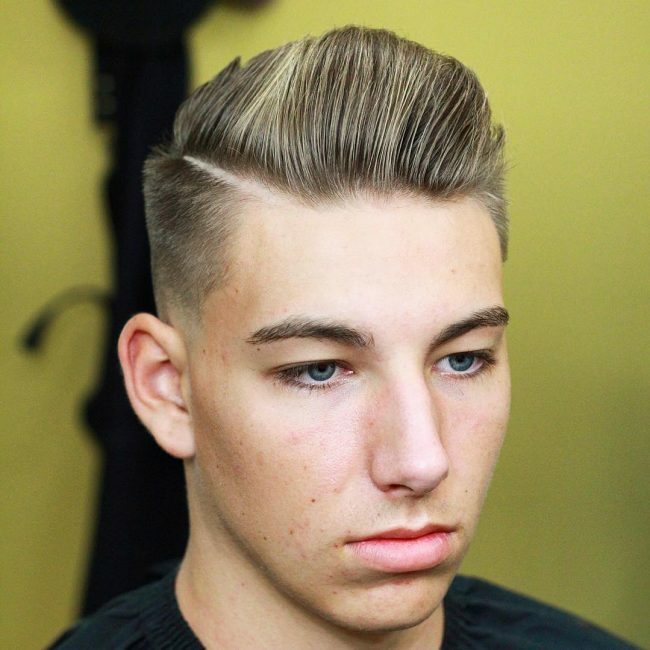 In this hairdo, it makes the short modern pompadour look very classy, and you only need to enhance it with a side part and taper fade to create a chic appearance. You can replicate the messy top of this hairdo with little effort as you only need to give your long locks an upsweep and run your fingers through them. But, the cut would not be complete without the soft side part and skin fade. The height, texture and the styling of the locks at the top of this hairdo are magnificent. 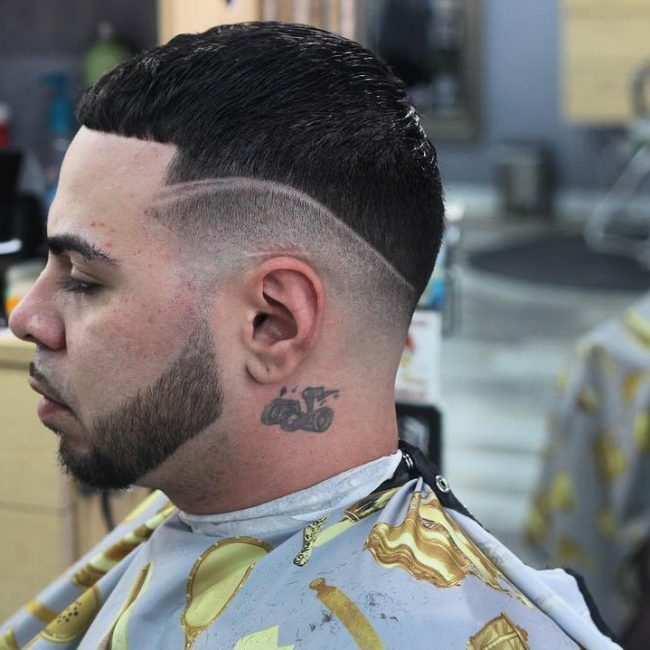 However, the sharp razor line on the sides and the skin fade below it are also vital in the creation of this upscale and modern look. The hard part haircut may not be a distinct headdress on its own, but it is still an exciting and trendy addition to your style. Regardless of how you prefer to shave your hair, it will always work for you. Try some of the adorable designs above and get a distinct look that will make you stand out.